COPrevent: Are we moving the needle on mental health? Are we moving the needle on mental health? Thousands of Coloradans – ourselves, our loved ones and our neighbors – face mental health challenges. Whether the issues are mild or more complex, they can leave deep and lasting impacts on our lives. A new Mental Health Data Spotlight helps to tell the story of how Coloradans are faring across the lifespan – youth, adults and seniors – when it comes to mental health. And answers the question: are we moving the needle on mental health? Insurance coverage in Colorado is at an all-time high, meaning many more residents are enrolled in plans that cover mental health services. Yet, rates of poor mental health remain stagnant or are climbing. The rate of poor mental health among the state’s adolescents has held steady since 2007, and more Colorado adults and seniors are struggling today than they were 10 years ago. Of significant concern is the state’s rising suicide rate. Data reveal that in 2014, there were 19.4 percent of suicides for each 100,000 residents, or 1,058 Coloradans, up from 16.5 percent in 2007. The Data Spotlight uncovers stark disparities in those likely to commit suicide, with individuals ages 45-54, men and individuals in rural regions with the highest number of deaths by suicide. 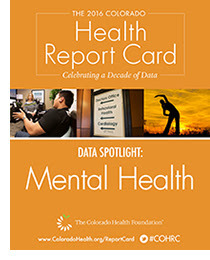 The Foundation, in partnership with the Colorado Health Institute, developed the Mental Health Data Spotlight as part of an ongoing series of Health Report Card deep-dives. Read the full Data Spotlight to learn more about this pressing health issue and how Colorado is taking action. Join the conversation on Twitter by using the hashtag #COHRC.